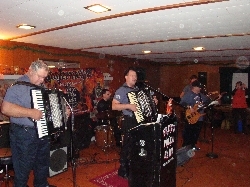 Fred, Rick, Fritz, Frank (partially hidden), and Gabe are shown here as FPB cranks out the final tune of their 30th Anniversary Dance on November 1, 2008 at Yaworski's Country Inn in Lee Center, NY. 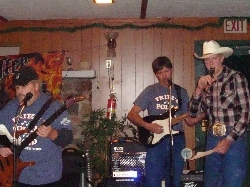 Fred, Fritz, and Rick are pictured here along with FPB Fan Club Member, Bonnie O'Dell as she sang a tune with FPB during FPB's third set of November 1, 2008. 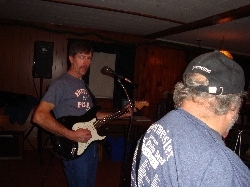 Frank and Gabe (or at least the back of Gabe) are pictured here during FPB's 30th Anniversary Dance at Yaworski's Country Inn in Lee Center, NY. 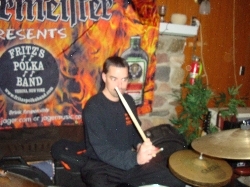 Rick focuses intensely as he drums along on November 1, 2008 at Yaworski's Country Inn during FPB's 30th Annivesary Dance. 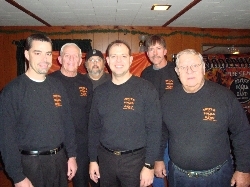 Frank (partially hidden) and Gabe are shown here on November 1, 2008 at the FPB 30th Anniversary Dance in Lee Center, NY. 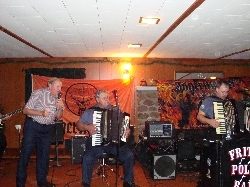 The guys in Fritz's Polka Band pose for a promo photo at the conclusion of their second set of November 1, 2008 at Yaworski's Country Inn in Lee Center, NY. 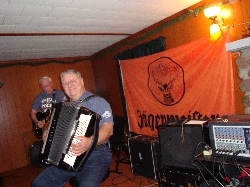 Fred and Fritz are pictured with FPB Fan Club Member, Bob Zeller, as Bob yodeled a few tunes during FPB's second set of November 1st. 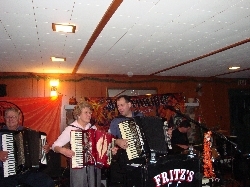 Tom and Fred yodel a tune during FPB's second set on November 1st, during the Fritz's Polka Band 30th Anniversary Dance. 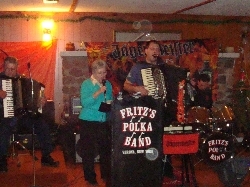 Fred, Fritz, and Rick are shown here along with FPB Fan Club Member, Betty Miller, as she jammed on four tunes with FPB during FPB's second set of November 1, 2008 in Lee Center, NY. 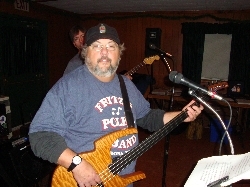 Gabe and Frank are shown here with Frank's son, Brian Nelson, as Brian was a special guest singer during FPB's second set on November 1st during the FPB 30th Anniversary Dance. 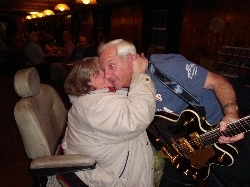 FPB Fan Club Member, Norma Gray thanks Tom for all the great years of his guitar playing and yodeling with Fritz's Polka Band, while at the FPB 30th Anniversary Dance on November 1, 2008 at Yaworski's Country Inn. 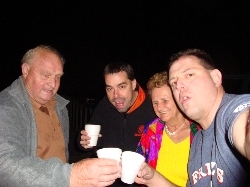 Rick and Fritz are pictured here with FPB Fan Club Members, Bill Crawford and Darlene Irish, as they have some Jagermeister punch on November 1st in Lee Center, NY, during the first intermission of the FPB 30th Anniversary Dance. 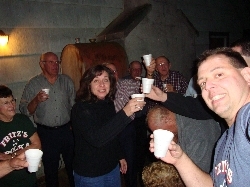 Fritz toasts some Jagermeister punch with members of the FPB Fan Club, including his sister, Linda (center), as well as other friends on November 1st during FPB's first intermission in Lee Center, NY. 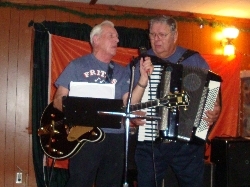 Tom and Fred are shown here in action during FPB's 30th Anniversary Dance on November 1, 2008. 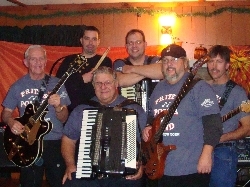 The guys in Fritz's Polka Band pose here for a group photo prior to their first set of November 1st at the FPB 30th Anniversary Dance in Lee Center, NY.